I made a collage of the pictures, featuring me and a bunch of friends who are mostly from CNU. They were a lot of fun to take. TRIVIA: Next to the girls in the anatomy lab pictures there were two grad students dissecting a small dog. 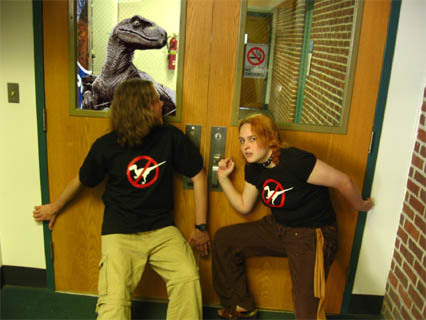 They were a little confused as to why we were in their lab being so triumphant about science, especially since the building was supposed to be locked, but in the end they decided that we weren’t a threat! Which was good because they had a bunch of really sharp knives. I hope you guys enjoy the shirts! So far I’ve had more friends buy their own, after seeing the samples, than any other shirt, so I think they’re gonna do well! Also, all the previously backordered shirts are going out today and tomorrow, so you should get those soon. My friend Sarah and I just got back from wandering around SPX, the Small Press Expo, which is an independent comics convention. It’s focused on real paper comics, but I stopped by because there were a few webcomics represented there. We met Jeph Jacques of Questionable Content, David Malki of Wondermark, and Colleen of Fluff in Brooklyn. Jeph, Jeph’s gal Cristi, David, Colleen, Colleen’s pal Marianne, Sarah, and I all went out for dinner at a very nice Thai restaurant and had a lot of fun. David filled my car with a story about telling the difference between Garfield the cat and Garfield the 20th president (“the beard, not the whiskers”). The expo was really cool. I hadn’t been to a convention before, and it seems this one is a good one to start out at. It was very grown-up, very nice and artsy and people tended not to have costumes or anything. Just a lot of hipsters hanging around with tables covered in absolutely breathtaking art. I picked up a copy of Two-Fisted Science, which I’d seen on BoingBoing, and blabbed at the author for a while. I’m at Sarah’s place, about to crash, and I just turned my head to the right and there were a pair of EYES, set in the face of a strange cat sitting on the back of the couch, literally an inch, an inch and a half from my face, staring at me intently. I propose all animals with quiet feet and eyes above a certain level of creepiness be fitted with bells immediately. A note on today’s comic: Judging from my inbox, a lot of people have a different perspective on the GRY puzzle than me. First of all, I believe it’s a fairly old riddle. But more importantly, I think that originally the “English Language” bit wasn’t even a part of this riddle. It was just a head-breaker because there was no answer. But then someone who thought they were oh-so-clever came up with the idea that somewhere in the puzzle it could be read as asking what the third word in the actual phrase “the English Language” was. That’s a pretty lame interpretation. There have been lots of rewritings of the puzzle to try to make it work a little better, but they’ve never removed the lameness. Some of them more friendly to that stupid interpretation than others. I’d been hearing the angry/hungry puzzle for years (and talked about the interesting fact that there was no answer) before I ever heard someone try the “language” thing. Snopes has a good article on this puzzle. I always hated those ‘lateral thinking’ puzzles — the ones where they said “oh HO, I never told you that the doctor’s mother was a midget and this was all happening a space station! Don’t you feel dumb now?‘ Because once I figured out that language was really, really flexible and imprecise, it seemed that the key to communication was just figuring out what they probably meant. And figuring out what they could possibly mean if you use all the wrong definitions and stuff is interesting, but I don’t think it teaches all that much more than bad communication. These should be kept very separate from actual logic puzzles, which are really neat. There’s a thriving section for them on the forums, and a lot of people found my site looking for the answer to the Blue Eyes puzzle (which is great because it doesn’t use trick language anywhere — indeed, I’ve rewritten it over and over to make it as unambiguous and clear as I can — and yet the answer is incredibly elusive). My about page mentions that I work for NASA — I’m technically a contractor working repeated contracts for them. However, they recently ran out of money to rehire me for another contract, so I’m done there for now. This isn’t really bad, because it came right as the t-shirt orders were becoming so strong that I really needed the time off to handle them. Combine that with answering the huge amount of email I get through the site, drawing the actual comics, and assorted other things, and I really don’t have the time to work a full-time job at the same time that I do this comic/store. So, for the moment I’m now a full-time webcomic artist/t-shirt designer. I don’t know how to thank you enough for all the support. I shipped out the domestic preorders last week, and the international orders were held up by the post office and didn’t get through until this week. This was a bit later than I planned, and I’m sorry. For the week of the main shipping I was literally working every waking hour, 16 hours a day, on getting the t-shirts out, along with a lot of help from friends. For those who ordered shirts, if there was any kind of a mistake in your order, let me know and I’ll send you the right shirt(s) immediately. T-shirts have been taking over the apartment, and the supplier is still working very hard to try to meet the demand. As mentioned on the t-shirt page, a few orders might be delayed right now as I try to catch up and keep stocked, and I appreciate your patience. Sizes marked with “backorder” will be shipping probably around the 20th. A lot of you have been asking what happened with the project I did a while ago to come up with a neat date. I know I have been quiet about that, but it’s mainly because the girl in the project had been relatively out-of-touch, and I couldn’t easily talk about what was up since I hadn’t talked to her and wanted to give her some privacy. She basically started to feel uncertain about the whole thing, and I didn’t want to push her, so I called it off. The winning suggestions are here, and I will be hanging on to the full list for a while and maybe doing something interesting with it. xkcd comics have been featured in a lot of neat places, and I will try to mention them here as that continues. The one I have in front of me is the Toike Oike, the University of Toronto’s long-running high-quality humor newspaper. Two of the guys who did the COBE experiment — the one shown on the back of my t-shirt — won the Nobel Prize for their work. I’ve sent them both free t-shirts. Maybe they’ll wear them to the prize ceremony.